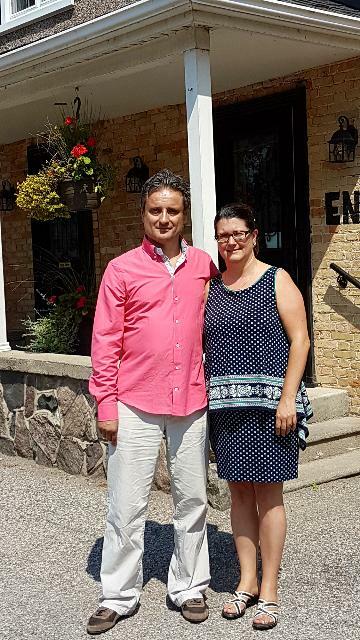 Coming from part of the world where wine and fine cuisine is of uttermost importance, my wife and I, Nicoleta and Alin Dinu, hope to continue the wonderful establishment that is the Easy Pour Wine Bar. Having a passion for wine and great food, we understand that a complementary glass of wine is just as important as the dish itself. The classic atmosphere of the restaurant is the perfect place to satisfy our hardworking nature as we will be working towards something that we love. Having been exposed to many cultures gives us a great taste in music and we are certain there is no better way to enjoy a wonderful dinner than to live music. With these characteristics, the restaurant can only improve from here on out all while maintaining the traditional feel that the food, wine, live entertainment and setting deliver. Located in the quaint village of Blair, Ontario. The Easy Pour Wine Bar is the ideal spot to taste, explore and enjoy a relaxing wine experience. Come visit our Heritage designated property, built in 1856, and enjoy the warmth of the heritage charm and rustic surroundings! Take a walk up our "Crooked Stairs" and seat yourself in a comfortable lounge chair, or pull up a stool to the bar and relax while you enjoy your visit. Whether you are an avid wine connoisseur, or a novice taster, there is something for everyone! The Easy Pour Wine Bar is about exploring and tasting. We offer a small, and sharing size plates of a gourmet style menu with a variety of perfectly paired cheeses, breads, and simple dishes to compliment your tastings. Utilizing locally grown produce and the freshest ingredients, our innovative Chef has created the perfect compliments to enhance your wine experience. Our varied wine list, uniquely displayed by characteristics, will be certain to offer something for all tastes. Ongoing, we will continue to add to our list and expand our selections to enhance our offerings, and prepare for your return visit! Of course for the non-wine drinkers, we also carry a variety of craft beers, and specialty cocktails. At The Easy Pour Wine Bar, we encourage our guests and friends to join us, relax, and simply enjoy the journey of wine tasting from many regions around the world. Our growing family of staff and hospitality experts are on board to execute the perfect guest experience! Our philosophy is to ensure our guests enjoy their visit and are treated like friends and family.